Modern cars would be incomplete without them: cabin air filters. Without these filters, pollen, soot from diesel exhaust, fine dust and other contaminants enter directly into the vehicle. Here they accumulate in increasing concentrations. In other words: The passengers would breath in this “filth” unfiltered. The consequences can quickly become fatal for allergy sufferers, in particular. Itchy or watery eyes and sneezing are just the more harmless symptoms of allergic reactions. Over the medium and long term, the undesirable pollutants and particle accumulation inside the vehicle can damage the health of all passengers. 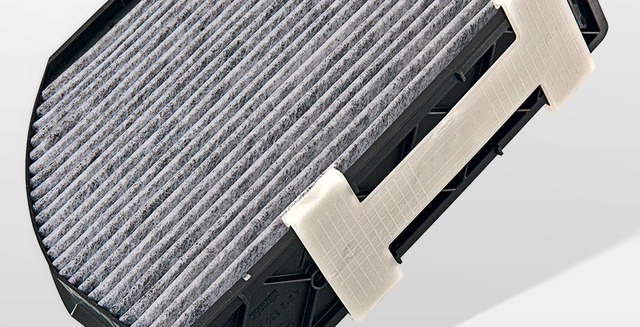 micronAir cabin air filters have been ensuring clean air inside cars since 1989. Since 1996, micronAir combi filters with activated carbon layer have even been adsorbing additional odors and irritant gases such as benzene and ozone. These are suspected of causing headache and coughing. Since 2016, micronAir blue has also kept out fine dust and allergens. The filters from Freudenberg therefore protect the human body and increase driving comfort while also ensuring greater safety. After all: Have you ever considered how far you drive blind with closed eyes during a prolonged sneezing fit? It would be better to prevent this in the first place! And heating and air-conditioning systems suffering from dust exposure can result in clouded windows, something no one behind the wheel wants.